BIG FLATS, N.Y. (BRAIN) — Stan's NoTubes has hired Clayton Goldsmith. Initially, Goldsmith is focusing on OE sales in Europe, the Middle East and Africa, but he will also lead several internal projects aimed at improving product availability and reducing lead-times for European customers. BOURNEMOUTH, United Kingdom (BRAIN) — Reid Bikes has opened its first Argentina distributor, Aries Comercial SA. The distributor placed its first order this month, the UK-based brand announced. OGDEN, Utah (BRAIN) — This community north of Salt Lake City, which is home to a growing number of bike and outdoor industry companies, is hosting a trade mission from the European Commission later this month, in an effort to attract more outdoor companies to do business in the area. HELSINKI, Finland (BRAIN) — Amer Sports has announced that Bernard Millaud, the president of its cycling category and a member of Amer Sports executive board, has decided to step down from his current role and is appointed to a special advisory role reporting to Amer Sports' president and CEO Heikki Takala. CINCINNATI (BRAIN) — Steadyrack, based in Perth, Australia, has formed Steadyrack USA, based here. FRIEDRICHSHAFEN, Germany (BRAIN) — Export figures supplied by Taiwan's Ministry of Finance shared at a press conference organized by the Taiwan External Trade Development Council (TAITRA) on day two of Eurobike paint a rather bleak picture. The company behind the Cannondale-Drapac squad said it needs another $7 million to continue next year. BOULDER, Colo. (BRAIN) — Slipstream Sports, the company that owns and manages the pro road team currently known as Cannondale-Drapac, has launched an Indiegogo crowd-funding campaign in a bid to continue racing in 2018. FRIEDRICHSHAFEN, Germany (BRAIN) — Eurobike received more than 458 applications from brands for this year's Eurobike Awards. A panel of six judges honored 43 winning products, and 11 companies took home Gold Awards during a ceremony held at the Messe Friedrichshafen on Wednesday evening. SCHWEINFURT, Germany (BRAIN) — Marcus Schneider has been appointed SRAM's director of business development for e-MTB and e-mobility. 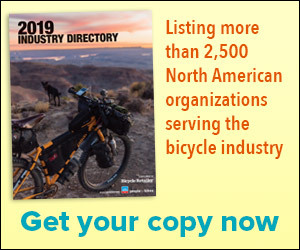 The new role will focus on identifying opportunities in the e-bike market, defining strategic goals, and establishing and developing key customer relationships. HELSINKI, Finland (BRAIN) — Amer Sports has updated its 2020 growth target. Instead of aiming for sales of 3.4 billion euros ($4.2 billion) in that year, the company is now setting a target for "annual mid-single-digit organic, currency-neutral growth." Cyclists are generating ride data, but what to do with it? FRIEDRICHSHAFEN, Germany (BRAIN) — Riders are generating data on Strava and COBI or riding with smart connected devices like See.Sense and Garmin, but data is collected in many different ways and stored in various locations. FRIEDRICHSHAFEN, Germany (BRAIN) — Germany saw cycling-friendly weather sooner than usual in 2017, which helped kick the season off early. But the amicable climate wasn't enough to boost sales. SCOTTSDALE, Ariz.— U.S. industry veteran Paul Lew has been named CEO of the newly restructured Edco cycling company, now based in Arizona. WEITERSTADT, Germany — As e-bike manufacturer Riese & Müller celebrates its 25th anniversary this year, the company is on the brink of expanding both its market reach and its production capacity. PUERTO DE MOGAN, Gran Canaria (BRAIN) — Davide Campagnolo, 36, sticks out in the riding group that heads out of Puerto de Mogan, Gran Canaria. FRIEDRICHSHAFEN, Germany (BRAIN) — Given the turmoil swirling around new dates and locations for trade shows next year, Eurobike is looking like a beacon of calm — and doing the same old, same old never felt so good. Add to this a healthy European market and continued e-bike product innovation, and it’s not surprising that Eurobike head Stefan Reisinger expects a show a bit larger than last year. BREMBATE, Italy (BRAIN) — The German high-end component brand THM, which was acquired by 3T last year, is now distributing to European dealers via its own B2B sales platform. The company said the system offers retailers enhanced transparency of the order process and quicker fulfillment. NEW YORK CITY (BRAIN) — Phillip Lucas is transitioning to part-time consulting work with Velocomp, where he has worked for the past year. Lucas is returning to Europe to live closer to his family and work via his Netherlands-based consulting firm, Upshift Sports Consulting.